Sometime around 1900 three Lifton brothers, Sam, Maurice (Morris), and Henry came with their family to America from Russia, where the family had been in the leather hide business. Maurice and his cousin, Simon Munitz, establish the Keystone Leather Goods Co. with Maurice as president and Simon as Secretary. By September 1918 "S. Lifton" is president (almost certainly Sam Lifton.) Then by November 1918 Maurice and Sam establish The Lifton Mfg. Co. It's possible that they retained ownership and management responsibilities in both companies. Two addresses are listed in the Trow’s Directory notice (above) for the Keystone Leather Goods Co. 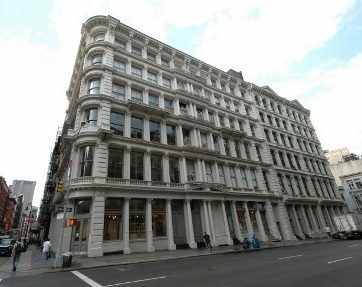 The first one, 473 Broome St., New York, is the famous Gunther Building, in the Soho District. It originally housed commercial textile factories, and in1915 had at least one other leather goods company. The second address, 162 Monroe St. is a residential area. 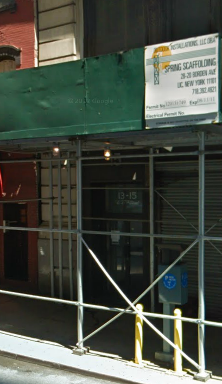 That address appears to be the former location of a multi-story townhouse, but is currently occupied by a small garage. It evidently was the home of Maurice Lifton or possibly Simon Muntz. 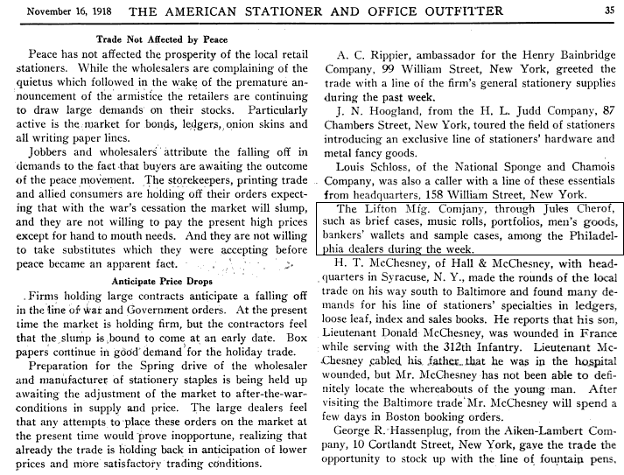 An additional address is given in the September 28, 1918 article above for a new uptown showroom. This building is shown in the lower right photo. 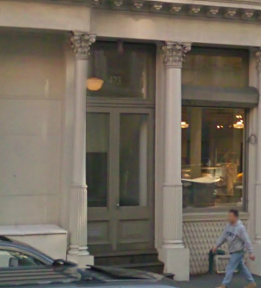 Right: The Gunther Building’s 473 Broome Street Entrance to the former Keystone Leather Goods Co. 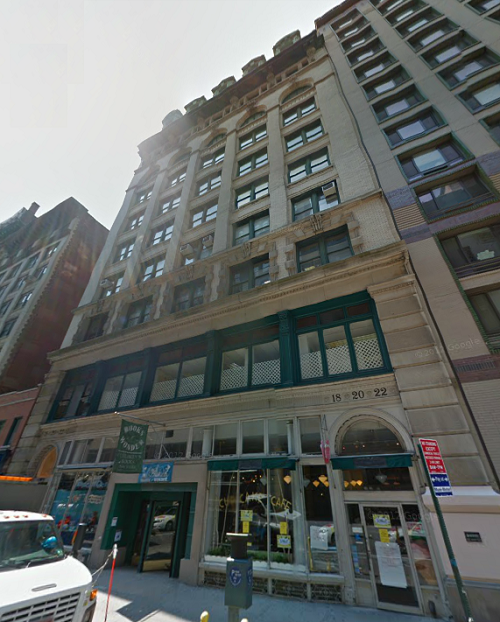 Right: 130-132 W. 42nd St., 17th Floor Uptown Showroom of Keystone Leather Goods Co.
Brothers Morris and Sam Lifton start The Lifton Mfg. Co. It’s not certain exactly when in 1918 the firm is established, but the first published record of activity is November 16, 1919, when it is reported that Lifton sales representative Jules Cherof had called on music dealers in Philadelphia. It’s worth noting that the U.S. had been involved in World War One since April 6, 1917 and the draft had caused labor shortages and uncertainty for business. The final Allied counteroffensive began in August and Armistice Day was November 11, 1918. The knowledge that the “Great War” was ending may have provided confidence to proceed with the new Lifton enterprise in late summer or fall of 1918. 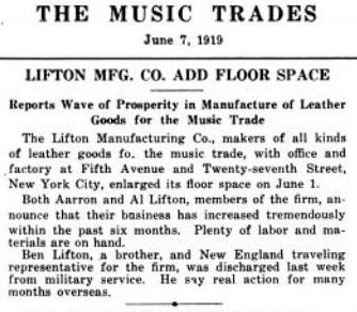 The First Published Mention of the Lifton Mfg. Co. 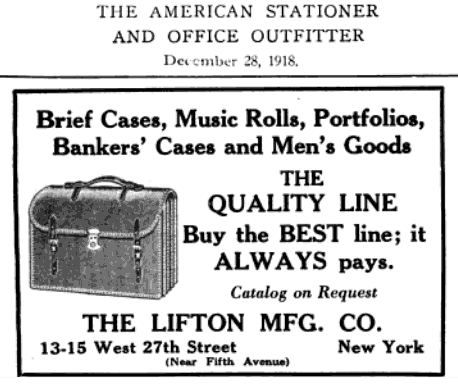 The first known advertisement for the Lifton Mfg. Co. The company name is in regular type rather than the script logo that goes into use in early 1919. 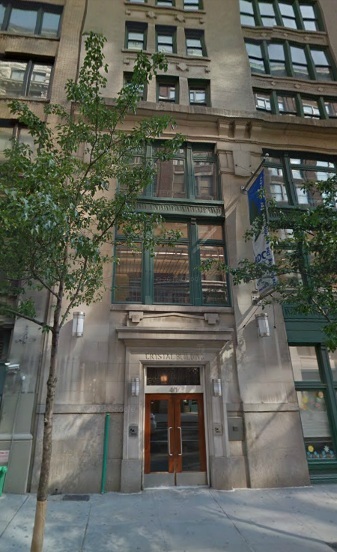 13-15 West 27th Street, New York, N.Y.
At the beginning of 1919 Lifton has 70 workers and 6,000 square feet of floor space; an entire floor at 13-15 West 27th Street. By April they occupy an additional floor, adding another 6,000 square feet. They also begin using a newly designed script Lifton logo that continued to be used throughout the history of the company. 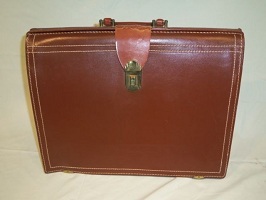 The company specializes in leather bags and cases to accommodate sheet music or business papers. 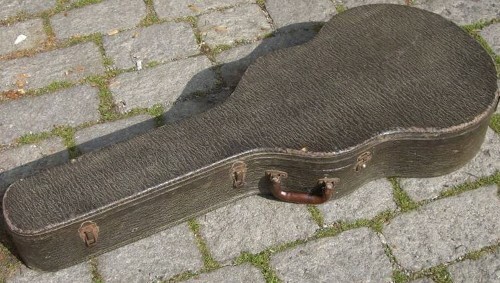 The first mention of musical instrument cases is not seen until 1920. Morris Al, Aaron and Benjamin Lifton are all mentioned in articles this year. The 1921 trademark notice for the script “Lifton” Logo. 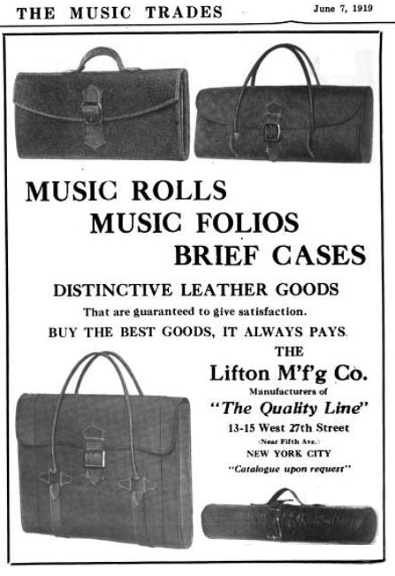 Music bags, satchels, rolls, and music brief cases are selling faster than ever for the firm of Lifton Manufacturing Co. at 15 W. 27th St., New York City, manufacturers of all kinds of leather goods. Many piano, talking machine. 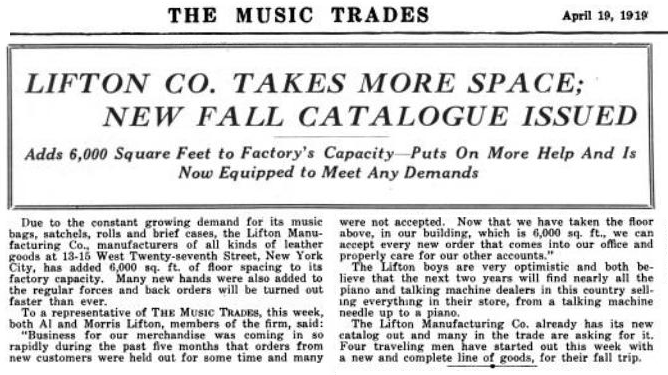 and sheet music dealers are adding musical merchandise departments and among the first steps taken by them is stocking up with leather goods. The Lifton Co. has established many jobbers thoughout the West and reorders are again flowing into the office. All hands are working at top speed. Holiday orders are being taken care of specially and it is expected to complete all orders within a short time. New machinery was again installed in the factory and shipping facilities increased. The Lifton Mfg. 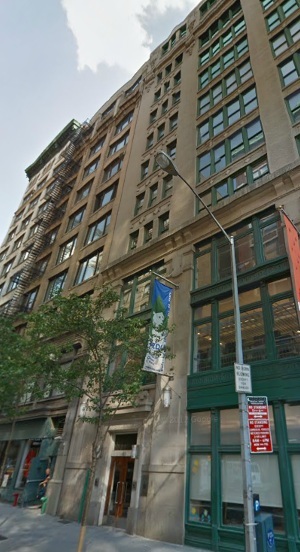 Co., 15 West Twenty seventh street, New York City, leather goods manufacturer, has purchased a factory in New York City and will manufacture musical instrument goods for the trade. The firm is now specializing in sheet music rolls and cases. The company recently gave a dinner at the Hotel Pennsylvania to their salesmen. It was the first get-together party of the firm, and it is planned to make it an annual event. The salesmen attending the dinner were A. R. Epstein, Julius Scherof, Van Lifton, Henry Lifton, J. M. Schaeffer, Peter Castro, Morris Lifton, Aaron Lifton and Morris Brooks. A new factory has been opened for the exclusive manufacture of violin cases by the Lifton Mfg. Co., at Rockaway and Newport avenues, Brooklyn, N. Y. This is the third factory now in operation by the Lifton Co. 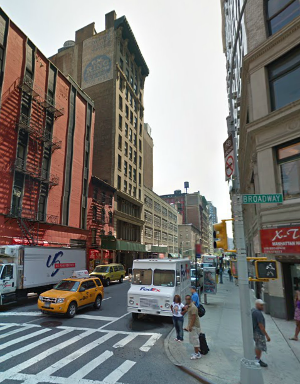 The other two factories are located at 15 West Twenty-seventh street, New York City, where the general offices are also located. The two original factories are devoted to the manufacture of music rolls, brief cases, satchels and other leather and keratol articles for the small goods industry. NEW INCORPORATIONS. ; New York Charters. 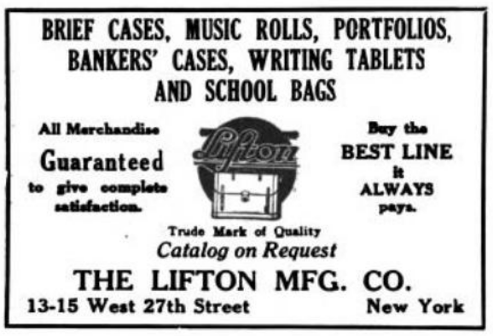 Henry Lifton Manufacturing Co., Make brief cases and portfolios. 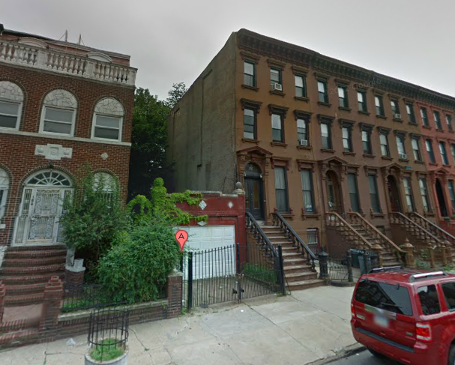 $25,000, H. Lifton, P. Zeidman, J. Vermus; attorney L. Rocklin, 110 Rivington St.
On August 28, 1920 Henry Lifton is mentioned as a salesman for Lifton Mfg. Co.
Now about a year later he begins his own company. This September advertisement mentions cases for violins, banjos, banjo-mandolins, tenor-banjos, clarinets, oboes, saxophones, trumpets, coronets, and flutes, but not for guitars or mandolins. 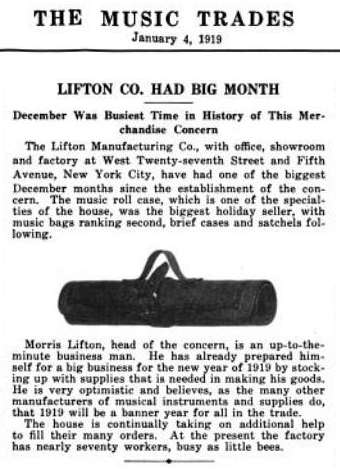 New York Case Maker Expects Good Business in Musical Merchandise in 1922 AND That the Lifton Mfg. Co. has every intention of going after business aggressively, this year is demonstrated by the fact that right at the start of the year the musical merchandise trade received the new catalog of this house. The Lifton Mfg. Co. manufactures a complete line of cases for all kinds of musical instruments at 15 West Twenty-seventh street, New York City, and the new thirty-five-page catalog contains a complete listing of these instruments. The catalog is an artistic one, with several pages in which the cases are reproduced in original colors, and each article is accompanied by a complete description. "To the Trade:—This catalog illustrates the several lines made by us. Quality, backed by the right guarantee, will increase your sales. The best Lifton advertisements are never published in any magazine or newspaper. They are words of praise freely spoken by the merchants and customers who have bought and used our cases. "They are so well made and of the highest grade materials and workmanship that we do satisfaction. If at any time any of our merchandise becomes defective return same and have it repaired without charge. "Leather goods are manufactured at our New York factories, located at 13-15 West Twenty seventh street. "The musical instrument cases are made exclusively at our factory, located at 823-825 Rockaway avenue, Brooklyn, N. Y. "Visit our showroom, which is centrally located at 13-15 West Twenty-seventh street, right off Fifth avenue, where we will be pleased to show you our complete line." Note: The original Lifton factory building that was located at 823-825 Rockaway avenue, Brooklyn, N. Y., is no longer in existence. The Lifton Mfg. Co., New York City, made a comprehensive showing of its line of musical instrument cases and leather articles for the music trade in Room 641. Especially complete was its line of violin cases in every grade, including pigskin, hornback alligator, plain alligator, seal and shrunk walrus. A sample case demonstrated the framework of the case of three-ply veneer. This concern specializes in leather goods for musical instrument dealers and showed also a line of cases for the entire banjo family and a complete line of music satchels and bags. Those in charge were A. R. Epstein, B. F. Lifton, Jules Cherof and Frank Scott. 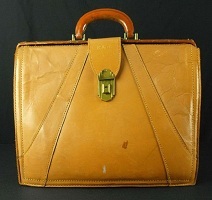 This is the first notice of Lifton cases made with exotic leathers. Lifton’s New York location put them in proximity to highly paid professional musicians who desired and could afford the best cases. 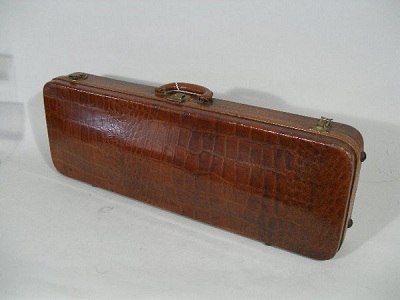 Lifton’s experience with leather goods helped them to produce very high-end violin cases covered with exotic leather. The Lifton Mfg. Co., New York City, manufacturer of high-grade cases for musical instruments, announces that it has obtained a large yard near its Brooklyn factory which will be used for the storage of a large supply of veneers. Business has been on a steady increase with this company and it is entering upon a busy season with an excessive supply of orders. 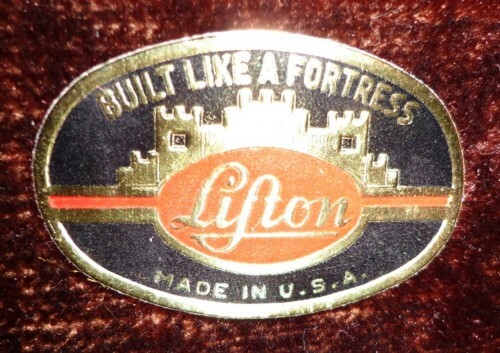 LIFTON MFG. CO. New York City. 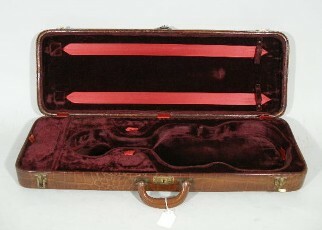 Will exhibit their line of musical instrument cases at the Drake Hotel, with Maurice Lifton and Jules Cherof in charge. Mr. Lifton has been fortunate in having the co-operation of his brother, Aaron Lifton, as factory manager; H. H. Brooks, advertising and sales manager, and a good selling staff. Attractive New Showrooms of the Lifton Mfg. Go. 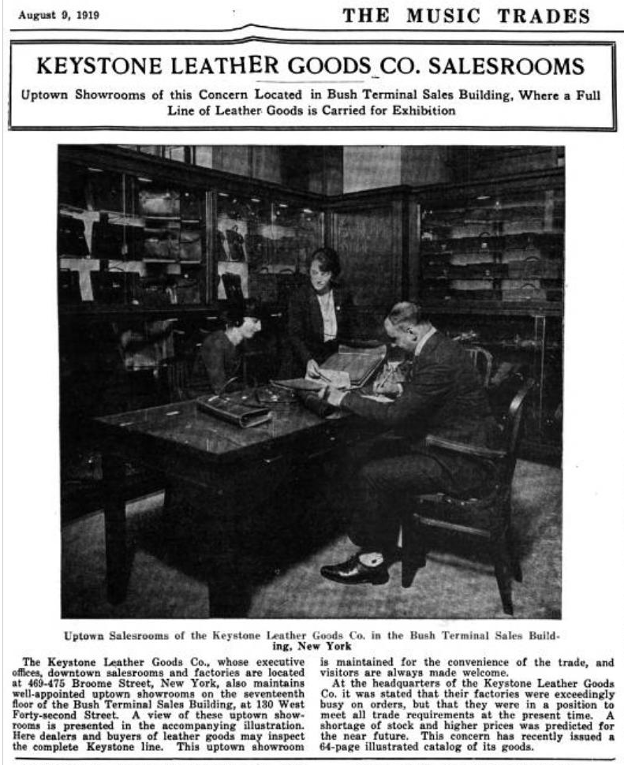 The new showrooms of the Lifton Mfg. Co., manufacturer of musical instrument cases, 40 West Twentieth Street, New York, are now completed and ready for the display of the Lifton line for the inspection of the trade. Beautiful is the right word to use in describing the Lifton showrooms, for they represent the last word in artistic interior decoration. As the customer steps off the elevator on the eleventh floor of the modern loft building in which the Lifton factory is now located he finds himself in a reception room the very atmosphere of which is inviting and bids him welcome. The information girl is seated in against a background of a special sample show case which has some prize leather cases on display, electrically lighted to bring out the merits of the cases to best advantage. This reception room leads to a much larger sample room. The woodwork of this room is finished in white enamel and the four walls are lined with modern wall cases. Each case has several rows of glass shelves for the display of Lifton products. The lighting effects in this room are most unusual. In addition to special lighting fixtures in each case there are several handsome imported cut glass chandeliers which diffuse a soft light over the cases. Comfortable chairs and tables finished to match the woodwork make the room a most pleasant one. The floor covering is a rubberized checkered tiling. The complete Lifton line is on display now in the showroom. This includes cases in the finest grades of leathers, as well as imitation leather, fiber, duck and canvas. 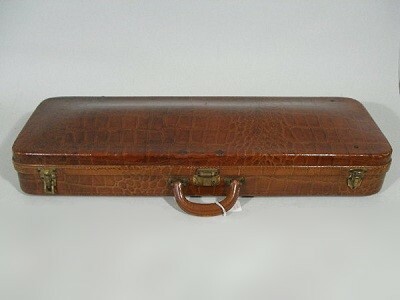 Several styles of heavy alligator skin cases are also popular. 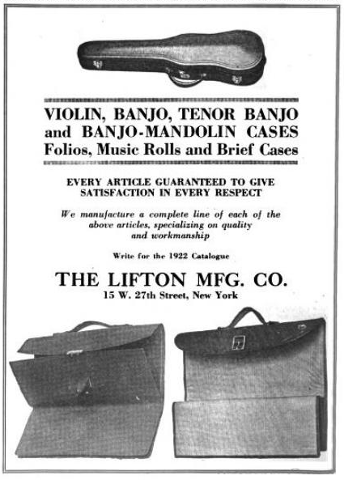 The Lifton line includes cases for violin, tenor banjo, banjo, banjo-mandolin and lute mandolin, as well as for music stands. 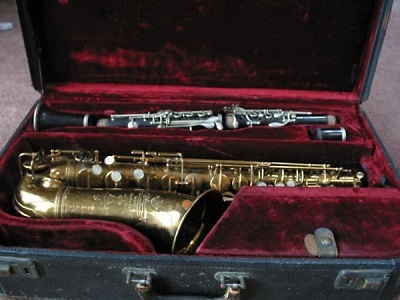 Cases for saxophones, banjo-ukuleles and violas have just been added to the line, according to Maurice Lifton, head of the house. Lifton cases are sold by dealers in all parts of the country. The leading jobbers all carry a liberal supply of them at all times. Another important part of the business is the manufacture of cases for the leading manufacturers of high-grade banjos. Strict adherence to manufacturing principles that insure a quality line of cases at all times has contributed to the steady growth of the Lifton business, according to Maurice Lifton. Mr. Lifton is an experienced case maker who has learned the business by hard work from the apprentice's bench up to the president's desk. His ability not only to keep the factory working at full capacity, but to get out and sell goods, as well when needed, has been a large factor in the Lifton success. Mr. Lifton has been fortunate in having the co-operation of his brother, Aaron Lifton, as factory manager; H. H. Brooks, advertising and sales manager, and a good selling staff. 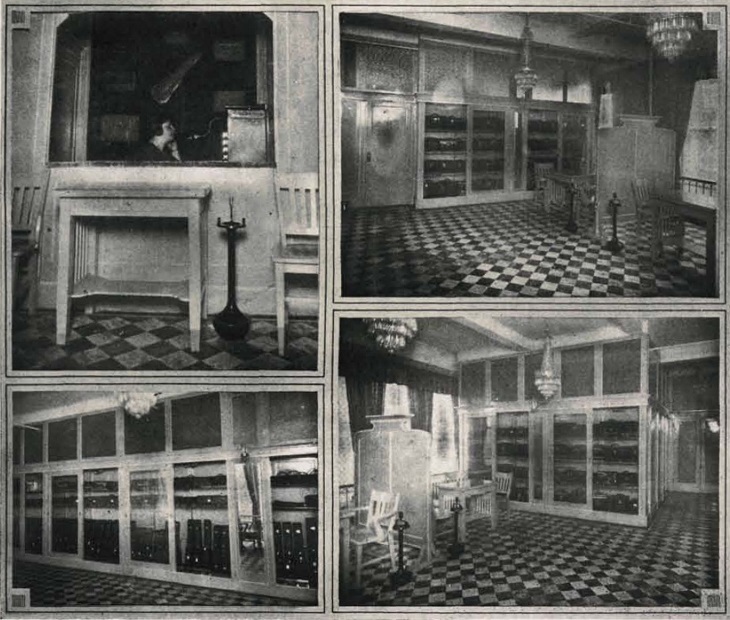 New 1924 Showroom of Lifton Mfg. Co. Note: The two right-hand pictures above show display cases containing briefcases and other small leather goods. The lower left picture shows display cases containing instrument cases, mostly for violin or other small instruments. In the two right-hand pictures above it is possible to see the three curtained windows of the 11th floor showroom. The same three windows can be located on the exterior picture of the building, shown below. The National Association of Musical Instrument and Accessories Manufacturers Plans Important Convention at Drake Hotel June 9. The National Association of Musical Instrument and Accessories Manufacturers will hold its annual convention at the Drake Hotel, Chicago, June 9, and according to President J. R. Stewart the meeting will give further evidences of the growth which has distinguished it from its formation. That phase of the music industry has problems peculiarly its own and it was the effort to solve them that prompted the formation of the national organization. These problems will be discussed at the convention at the Drake and the schedule of the business meetings assure an interesting time for the members. Board of Directors—J. R. Stewart, Walter M.
Gotsch. Fred E. Larson, C. L. W. Nelson, H. A.
W. L. Lange, G. F. Chapin and Morris Lifton. Notice the oval lock at the center of handle position, typical of prewar cases. 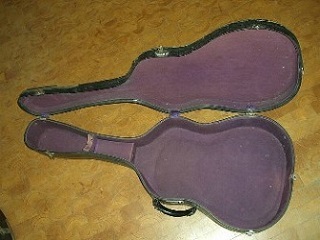 Postwar violin cases changed to a square shaped lock and then moved lock to left of handle. The ”D” shaped handle probably dates it to mid-1930’s or later. Los ANGELES, CAL., August 10.—One of the interesting sights during the recent convention of the Western music trades here was the Birkel window display which featured the new Lifton Koverite case for musical instruments. Morris Lifton, head of the Lifton Mfg. 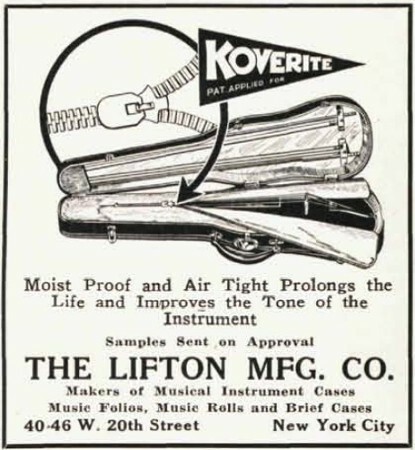 Co., manufacturer of the Koverite and other cases for musical instruments, New York, was here for the convention and brought along his new automatically operating display stand which advertises Koverite cases in a novel and effective manner. The Geo. J. Birkel Co. is a big distributor of Lifton products and it placed the stand in the center of their special convention window display. It attracted a great deal of attention, for it extolled the merits and features of the Koverite products as it snapped the colored cards on and off in the view of the spectators before the window. While the Koverite display held the center of the stage the huge Birkel window gave generous space to the other nationally advertised products that the store handles. In the rear was a huge purple velvet drop advertising Conn instruments, and there were posters and photos featuring the various artists using Conn band instruments and Paramount banjos. One big poster advertised Art Hickman's orchestra, which played at the convention, as a user of both Conn instruments and Paramount banjos. The Lifton Mfg. 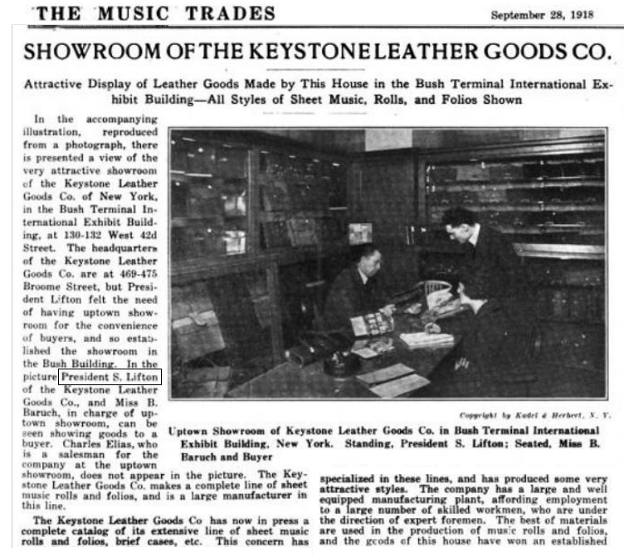 Co., one of the largest manufacturers of all kinds of leather goods and musical instrument cases for the music industry, are to be found in an up-to-date factory at 40-46 West Twentieth street, New York City. Members of the firm are Maurice and Aaron Lifton. They make complete lines of music bags, satchels, rolls, folios and brief cases and complete lines of violin, viola, saxophone, clarinet, banjo-ukulele stand cases, band cases, banjo, tenor banjo, lute and banjo mandolin cases in various leathers and skins. "Koverite" cases are also made by this firm. Complete lines of samples will be on display. 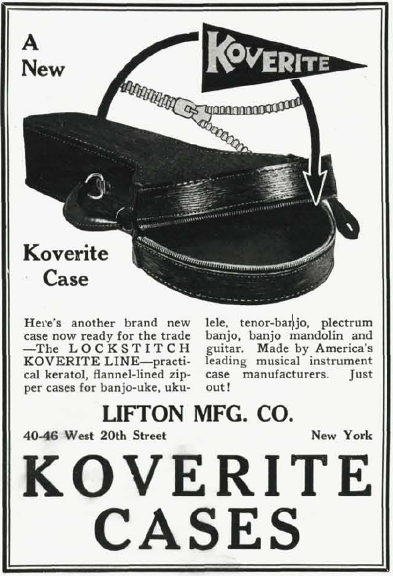 Koverite Cases had been introduced a couple years earlier. 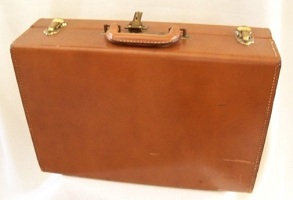 They were a standard wood-body case with an internal zippered fabric apron to protect the instrument. Now they announce an additional “New Koverite” case that is a soft case with a zippered opening. 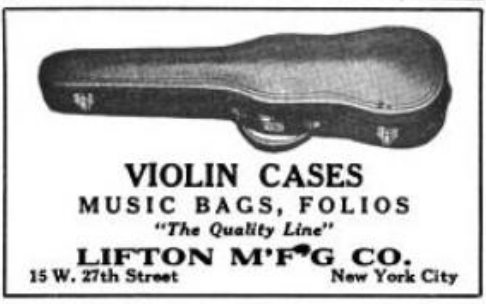 This ad contains the first known mention of Lifton guitar cases, although they may have been producing guitar cases previously. “New Koverite” case that is a soft case with a zippered opening. 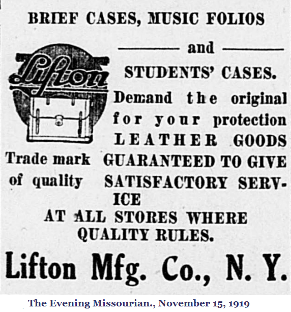 This ad contains the first known mention of Lifton guitar cases, although they may have been producing guitar cases previously. Other New Officers of Musical Merchandise Manufacturers' Association, Eastern Zone, Also Elected. At the recent meeting in New York of the Musical Merchandise Manufacturers' Association, Eastern zone, D. L. Day was elected president. Other officers elected were Walter Grover, vice-president; H. C. Lomb, secretary, and E. Stathopoula, secretary. The new board of directors is composed of M. Lifton, C. F. Martin, F. Gibson, G. F. Chapin and Walter Schmidt. Mr. Day reviewed the history of the association and pointed with pride to its steady development to an organization of vital force in the music industry. "There are big problems to handle in our trade and they can only be worked out by national cooperation," said Mr. Day. "We are now entering a most important era in our Eastern zone association, and I think that those of us who have attended national association meetings are now more vitally interested than ever. If we can strengthen our local body it will strengthen the national." Maurice Lifton, of the Lifton Mfg. 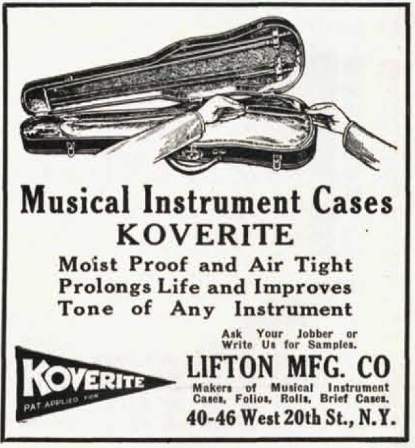 Co., manufacturer of Koverite cases for musical instruments, 40 West Twentieth street, returned Tuesday from a seven weeks' business trip on which he visited music dealers in nearly every city from New York to the Pacific coast. 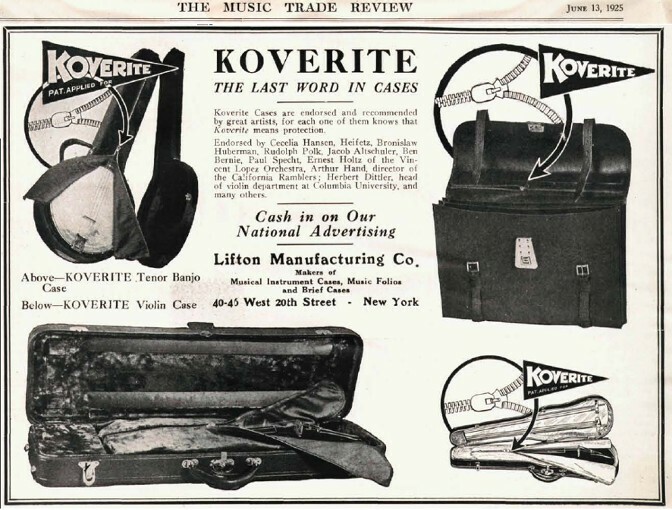 Mr. Lifton reported that business had begun to show considerable improvement particularly on the return trip and he stated that orders were not only good for Koverite cases but that there was an excellent demand for the Bellphonic portable talking machine which his firm recently brought out. "Wherever I went I found music dealers scratching their heads trying to puzzle out the answer to The Review's Ask Me Another questionnaire," said Mr. Lifton to a representative of The Review. "As one man said 'This is certainly a tough questionnaire. If they had easy questions like what is the most popular line of cases, we could answer it—Koverite'." This article mentions the "Bellphonic portable talking machine" (phonograph.) Lifton would have built the cases and installed mechanisms purchased from the Bellphonic Talking Machine Company in order to sell a portable version of the product. Geib & Schaefer had a similar product call the “Dul-C-Ton” portable phonograph which they sold from 1929 through the 1940's. 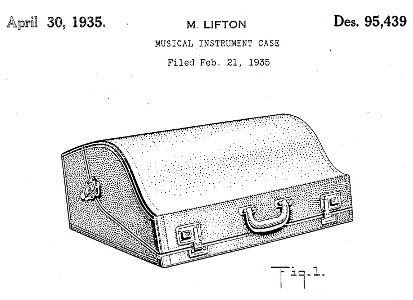 Patent 95,439, April 30, 1935, a design patent for a musical instrument case (accordion), Maurice Lifton, Aaron Lifton and Benjamin Lifton, as copartners, constituting the firm of the Lifton Mfg. Co. New York, N. Y.
Att: - Mr. Martin, Jr. If it is not asking too much, we would appreciate that you please let us have a sketch, in the form of a paper, showing the size of your new $40.00, $80.00 and $250.00 guitars. We are having requests for cases for these instruments. According to our records, the 017 shall take the $40.00 guitar, the C1 shall take the two $80.00 guitars and the F7 shall take the $250.00 guitars. Are we right? Your kind reply shall be appreciated. 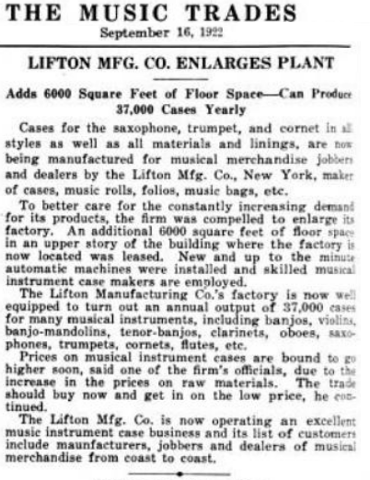 We can see from this letter that in 1935 Lifton begins to build guitar cases to fit Martin guitars. 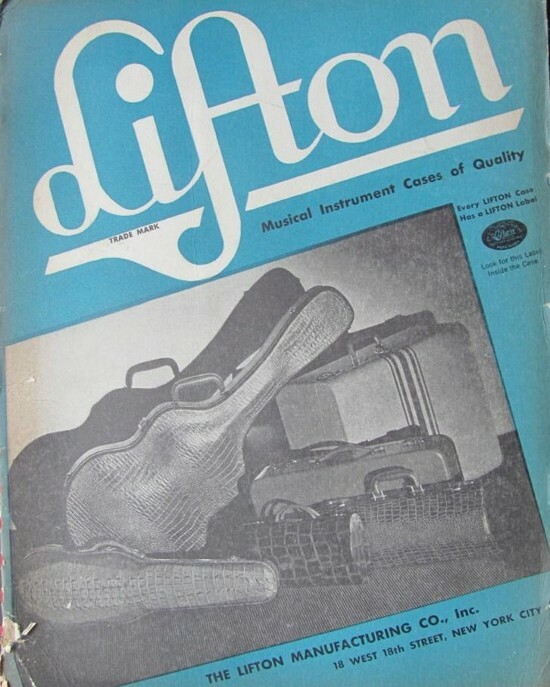 These were sold through distributors to music stores who would sometime pair a Lifton case with a Martin guitar rather than a Martin-supplied case. 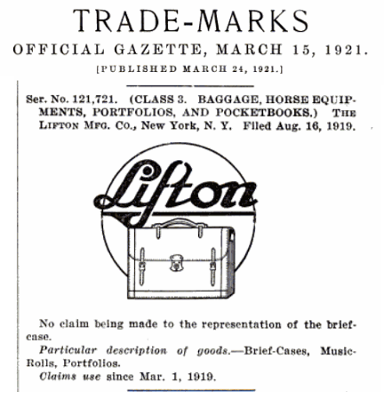 The letterhead seems to indicate that Lifton views itself primarily as a maker of leather brief cases and bags, with musical instrument cases as a secondary product. During the 1920’s, 1930’s, and 1940’s many patents were issued to Maurice Lifton. Some were for instrument cases, probably more were for brief cases or other leather goods. Here is one example. Patent 2,047,914 for brief case construction, issued July 14, 1936 to Maurice Lifton, Belle Harbor, Long Island, N.Y., assignor to the Lifton Mfg. 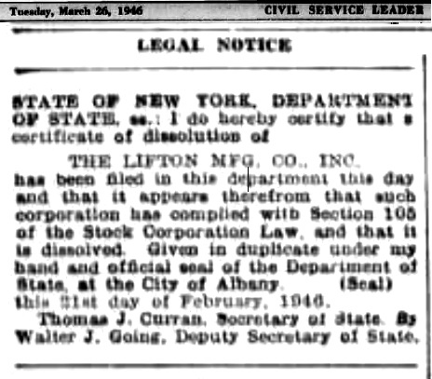 Co., New York, N.Y., a copartnership composed of Maurice Lifton, Aaron Lifton and Benjamin Lifton. This version of the label is rare since production was evidently curtailed during WWII and a newer black & red version of the Lifton Label came out at the end of the war. This same Oval Badge appears on the right side of the cover of the 1940 Lifton catalog below. 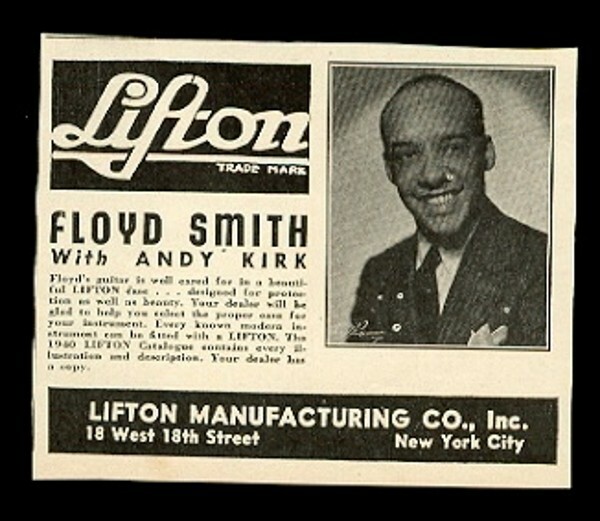 Text says: “Floyd Smith with Andy Kirk. 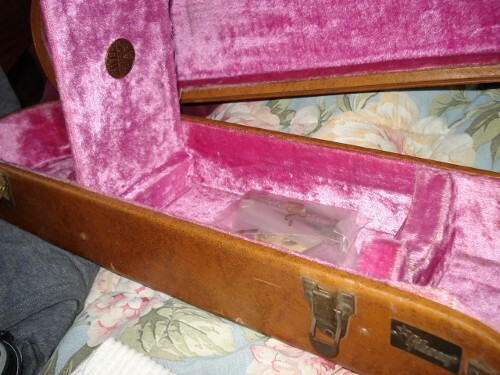 Floyd’s guitar is well cared for in a beautiful LIFTON case . . . designed for protection as well as beauty. 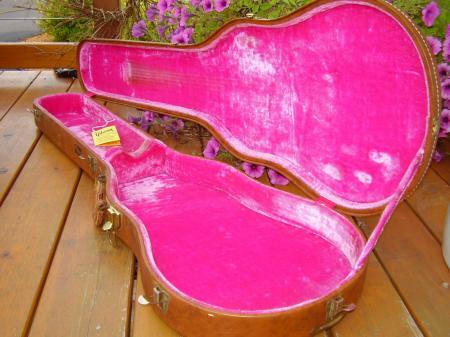 Your dealer will be glad to help you select the proper case for your instrument. Every known modern instrument can be fitted with a LIFTON. The 1940 LIFTON Catalog contains every illustration and description. You dealer has a supply. 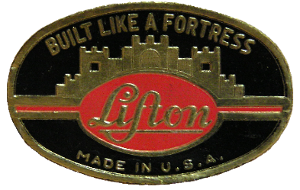 Lifton Mfg. 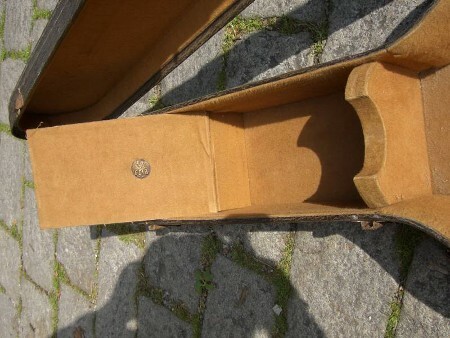 Company, 18 West 18th St., New York, N. V.
This is a Lifton guitar case that appears to be early 1940's. The 1939 case above has nickel plated hardware, and the 1940 catalog shows only cases with nickel plated hardware. This case has a new style of gunmetal black hardware. Is this possibly a result of wartime austerity? 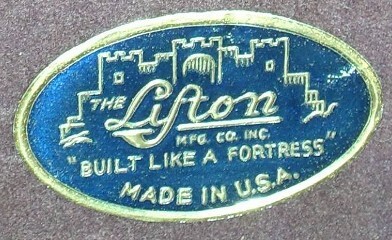 The 1939 case had a blue & gold Lifton label. This case has slight variation in black & silver. 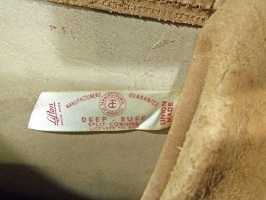 The Lifton Company had been incorporated in the late 1930’s. Now just a few years later the corporation was dissolved and the company returned to private ownership. It has been observed that some of the postwar Lifton cases fit several different size instruments equally well. 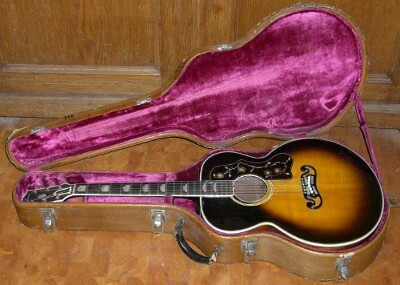 It seems likely that this is an intentional Lifton design, and one that would be attractive to music retailers who were selling a variety of Martin and Gibson guitars and could make use of a "one size fits most" case. Here's a late 1940's Lifton case with a Martin D-28, then a Gibson J-45, and then a Gibson L-50 archtop. It's not an absolutely perfect fit for any, but fits them all equally well. Usually it’s fairly easy tell the difference between Lifton and Geib cases. 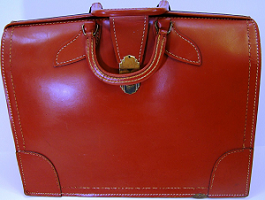 Geib cases usually have features such as an oval trademark stamp on the bottom, a diamond on the pocket lid, a medallion inside, or sometimes a “G”, “GS” or “Geib” stamped on the latches. 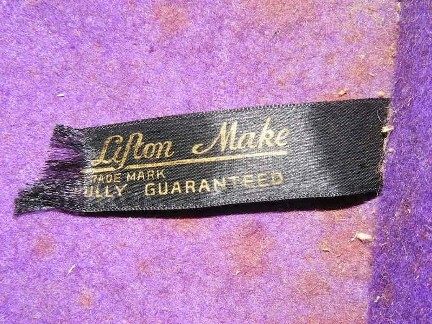 Prewar Lifton’s often had a trademark ribbon, and postwar Lifton’s had the oval label. But when both companies started building cases for instrument builders such as Gibson and constructing them to the builders' specifications it became impossible to tell the difference unless there was a logo; and often there was only a Gibson badge. Looks Like a Typical Lifton Case, Right? 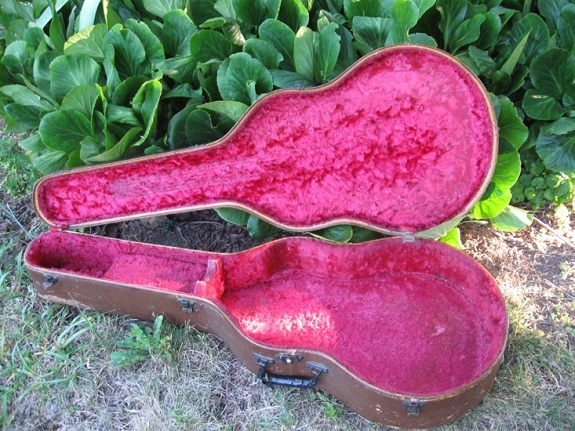 A Postwar Gibson Mandolin Case, Obviously a Lifton? 2008 - The current status of the Lifton brand. As of 2008 the Lifton trademark is owned by Banana Guitars Inc., Vero Beach, FL. They have produced some faithful reissues of the early 1950’s Lifton cases for the Gibson Les Paul guitar. My thanks to Steve Swan for information about the Lifton "Universal Case"